Spacious apartment with a minimum floor space of 66 square meters. Fully equipped, open plan kitchenette. Large living room with double french doors opening onto the spacious, covered terrace. Wall mounted 40" HD LCD TV with home LG cinema system. Beach towels provided free of charge. Range of books available to use free of charge. 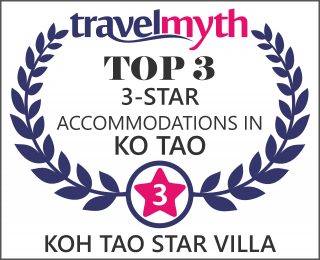 There are just two one-bedroom apartments at Koh Tao Star Villa. Both these luxury apartments are very spacious, with clean, elegant lines and furnishings. They share a huge terrace overlooking the surrounding jungle, Sairee Beach, and the Gulf of Thailand – it is truly a view to die for. And with a free taxi service to and from Sairee, there is no need to stay in the hustle and bustle of the town. Our one-bedroom apartments provide spacious, self-contained accommodation, with an en-suite bathroom, air conditioned bedroom, large living room, open plan kitchenette and west facing terrace. Add to this some high quality audio/visual equipment, free Wifi, stunning panoramic sea, jungle and sunset views and top quality service and you have some of the best accommodation available on Koh Tao. Each apartment is designed for 2 people, but it can accommodate 3 or 4 with an extra mattress set up in the living room. 4 is the maximum occupancy. Just so there is no confusion, the mattress is a queen sized inflatable mattress supplied with linen, pillows, extra towels and dressing gowns; this would be located in the living room. Please also note that the lounge is not air-conditioned. There is an additional charge of 1000Bt per night for the supply of the extra mattress. The villa faces west over the gulf of Thailand giving you outstanding, panoramic jungle, sea and sunset views to enjoy from your terrace. Please note that Koh Tao Star Villa enjoys these beautiful views because it is up a hill (some of which is steep). There are also quite a few stairs. As such it is unsuitable for the elderly or infirm or for children under the age of 10. We are off the beaten track – about a 15 minute walk from Sairee town and Sairee beach. The result is a very peaceful location away from the bustle and hubhub of Sairee and yet within easy access of the life and lights of the town/beach. By scooter this trip takes less than 5 minutes and we do provide a free taxi service to the town up to 10.30pm at night if you need it. If required, an extra bed can be provided at a cost of 200 baht a night. For our ‘long term’ guests please note that we do not provide our normal free daily taxi service to Sairee (as people staying for this length of time tend to require a greater level of freedom anyway and they rent a motorbike or scooter for their transport around the island) – we do still provide a free taxi service to and from the pier when you arrive and depart; also we do not provide a daily maid service – instead we clean every three days (including changing linen and towels) – we do ask that the apartment is kept tidy between cleans.